Educational programming is a cornerstone of SKyPAC’s mission. We offer a wide-ranging program of arts and education events, performances, attractions, classes and in-school activities all designed to achieve SKyPAC’s vision of creating a better community. Our vision, that over time K-12 students in the region will achieve higher graduation rates and college entrance exam scores than before SKyPAC opened, is the key focus of our education program. SKyPAC’s diverse offerings have the power to inform, enlighten and entertain all area citizens, encouraging them to remain in the area while providing a higher quality of life for their families. SKyPAC offers a wide-ranging program of arts and education events, performances, classes and in-school activities all designed to achieve SKyPAC’s vision of creating a better community. Our goal, that over time K-12 students in the region will achieve higher graduation rates and college entrance exam scores than before SKyPAC opened, is the key focus of our education program. We work alongside educators in the BRADD region to provide guidance for integrating arts into the classroom through artist-in-residence programs and professional development workshops. Each year, SKyPAC produces a variety of performances, held both at the Capitol Arts Center and in SKyPAC’s facilities, to entertain and educate the area’s talented young actors, dancers, musicians, and technicians. Programs will be designed for kids from six years old through eighteen years old, whether they are experienced or joining a theater program for the first time. 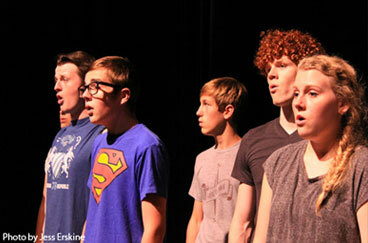 All performances will be led by talented guest directors, area theater professionals and SKyPAC staff. 2015-2016 Schedule Coming Soon!